Nestled in a far corner of the state, a small community made a commitment to recycling some years ago. Early on three local haulers collected and transported recyclable single stream material to sorting facilities in the closest large town, 180 miles away at an approximate cost of $55 per ton. Roughly 25% of the recovered material was not recyclable and ended up in area landfills. In 2016, an integrated Environmental Services firm built a $550,000 sorting facility (net of building and property) located at the landfill. 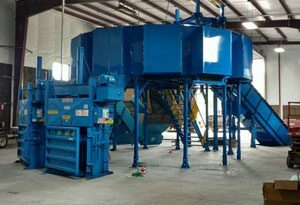 The facility included a Revolution© sorting system, a ferrous metal separator, two vertical balers, a horizontal baler, a pit, 14 collection bins and a feed conveyor. In total, approximately 80% of the community’s 4500 households are currently served by the facility. The diversion rate is approximately 40% with approximately 25% of processed material unrecoverable, yielding 30% system diversion. Community awareness and education should increase this yield over time. This level of diversion will extend the life of the current cell at the landfill 30% pushing out the need for expansion and reducing the landfill’s accrual for expansion by 30 to 40%. Two commodities, Glass and #3-7 Plastics are not economically recoverable and are going to the landfill currently. The addition of a glass pulverizer for $10,000 to create sand and gravel would create a locally salable item that would break even and not require landfilling. There is not a viable solution for #3-7 Plastics at this time, although there is one currently in development. The facility opened in June of 2016, beginning a 3-month shakeout and ramp up. The six-man team took time to learn how to operate the system while at the same time, surface and resolve any machine or operating issues. In August, the facility shipped its first truckload of paper at pricing 10% greater than plan. During this time, experienced operators visited the plant to train the operators and refine operations. By September, operations had stabilized near target levels and other local haulers were allowed to drop off recyclables for a processing fee approximately equal to the cost of trucking to town. They were able to do this because it was cheaper and easier to drop off material locally without having to manage the additional logistics of transportation. Improvements in October and November allowed the facility to sustain its design processing rate and increase its reach by bringing on new customers. 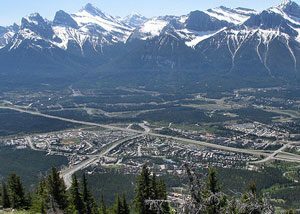 Faced with increasing landfill costs or pending landfill closure, rural communities have several options ranging from relying on systems in larger communities with greater means or creating their own system. Transportation of all or part of the waste stream is expensive. Although processing costs for smaller systems are higher than processing costs for larger systems, the total cost after transportation are competitive or at least profitable and can create the basis for a local system that creates local jobs and reduces landfill expenses instead of increasing the burden on the community.